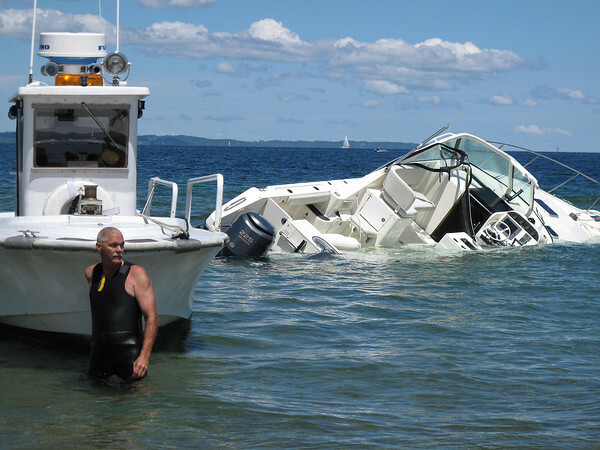 Terry Kiersey, of Traverse Dockside Marine, waits for the owner of a sunken boat to arrive at the shoreline of Grand Traverse Bay on Wednesday afternoon. The boat sank in heavy waves Tuesday — Kiersey said it appears both anchors on the boat were deployed, which played a role in its sinking. Kiersey identified the boat as a 34- or 38-foot Pursuit.